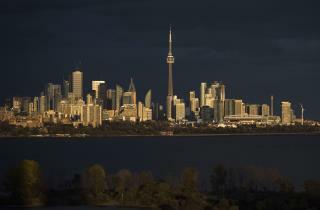 (Newser) – Toronto got an eye-popper Friday when it learned that Google—which is aiming to transform 12 acres of Waterfront land with tech-friendly development—actually wants to develop 350 acres and draw profit from sources including higher property taxes and a share of developer fees, the Toronto Star reports. Politicians at all three levels of government expressed shock at the plan to effectively develop and tax a huge swath of prime, mostly public city property. "There is no way on God's green earth that Premier Doug Ford would ever sign off on handing away nearly 500 acres of prime waterfront property to a foreign multinational company," a senior official tells the Star. This despite Google sister company Sidewalk Labs saying it has already discussed plans with officials. Just more proof of these tech giants dishonesty , they treat the public like idiots and that's money for you ! Perhaps if they try hard enough they can just buy Canada and enslave the populace. They have lent a helping hand in China. Canada should be next. The slogan 'do no evil' was just a smoke screen after all! And DOug Ford would have signed off on this in a heart beat. He is a crooked politician par excellence! This has been cooking all along in the queens park cabinet. Just as expected.